from Cambridge University Press, is "on press" and scheduled to be available by the end of April 2017. This site – machinehearing.org – will host errata, links to code, this blog, etc. Included in Part III of the book is a detailed description of the CARFAC (Cascade of Asymmetric Resonators with Fast-Acting Compression) cochlea model, corresponding to the open-source Matlab and C++ implementations on github. As a Principal Research Scientist at Google, I have had the opportunity to apply my long-time interest in hearing to many challenging problems in "sound understanding". Besides supporting these applications, Google has supported my creation of new-and-improved versions of auditory sound analysis methods as open-source code, and has also supported my writing of a book about the approach and details. 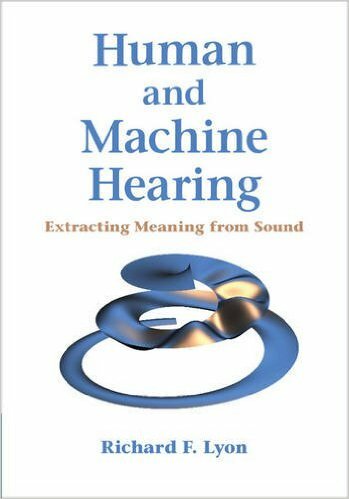 With the book finally finished, after seven years of work, I've started this blog at machinehearing.org as a place to get the machine hearing community involved in keeping the information correct and accessible.